Norwich City boss Chris Hughton has confirmed Sierra Leone striker Kei Kamara is among his list of potential transfer targets. 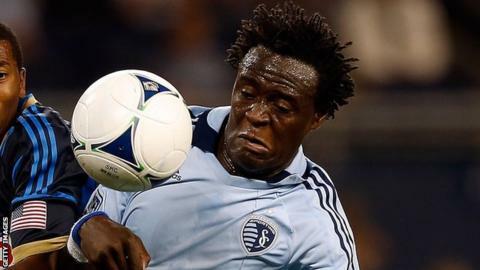 The 28-year-old plays in the USA for MLS side Sporting Kansas City and recorded his best-ever goal tally of 11 from 33 games last season. "He's someone I've been aware of for a while. But it's just an enquiry," Hughton told BBC Radio Norfolk. "But he would only be one of a few players," he added. "Of course, any players you make an enquiry about would be players you feel you can add to your squad." Kamara moved to the USA at a young age and came through the college system before starting his professional career with Columbus Crew. He has had spells at San Jose Earthquakes and Houston Dynamo, and joined Kansas in 2009. Hughton has and insists he has no qualms about bringing in a striker from outside of the Premier League. "I don't think it's about the league they play in," he said. "It's about making an assessment and we would always have to have good reasons for liking a particular player."